One of the most progressive and adventurous reggae artists in the industry today, Conkarah is not afraid to fuse musical genres and incorporate different sounds into his music. This can be heard in his last EP, Loverbwoy/Rudebwoy (2013), that fuses dub-step with reggae to create a new genre called “reggae-step”. 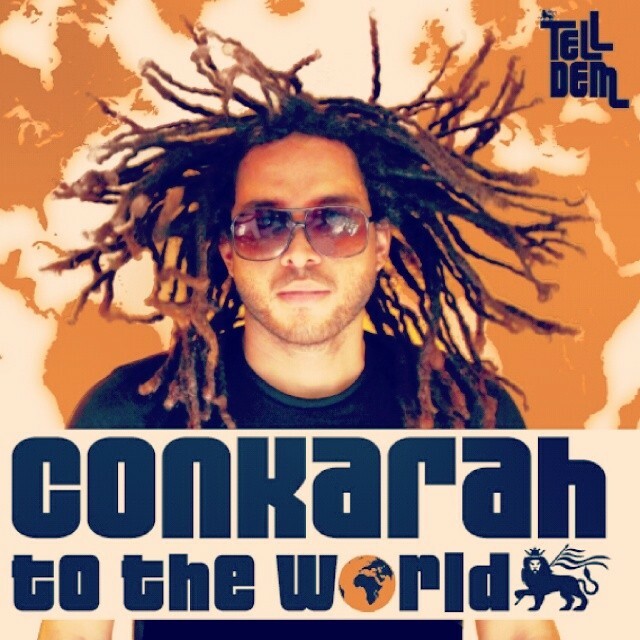 On Conkarah To The World, he includes a couple more reggae-step jams, lots of lover’s rock ballads and a few conscious roots tunes. The album’s first single, “Oceans Away” (produced by Australia’s Tuff Tumas) is a catchy, lover’s rock breakup anthem that infuses Spanish guitar melodies into the mix. Listen out for the pulsating percussion break during the bridge that features an awesome live drum solo. Conkarah’s positive and empowering lyrics resonate in listeners’ hearts and uplift their spirits. His signature sing-jay vocal style, which allows him to both DJ and sing, caters to both reggae and dancehall audiences alike. Conkarah sure knows how to appeal to the masses and will definitely reach the world with his new album. Watch the album’s first music video “Ocean’s Away” and the making of the EP. You can also listen to Conkarah To The World EP (2014) in its entirety below. What do you think of Conkarah’s new album? Comment below!